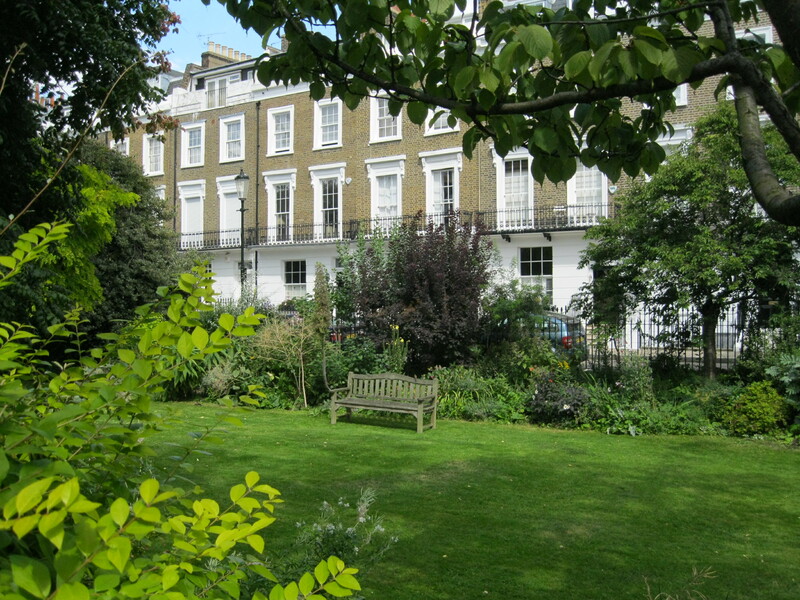 These are private communal gardens provided for the residents of Markham Square, which was built from 1836 on the site of an old orchard on the former farmland of Box Farm. It was named after Pulham Markham Evans, the last owner of the farm, and the Markham family reputedly had common rights since 'the 29th year of Elizabeth'. The garden was laid out as a cherry orchard in 1935 in celebration of the Silver Jubilee of King George V, and after WWII it was re-landscaped in the style of a country garden by the head gardener of the Royal Hospital. The garden now has shrub and flower beds with a central bed, lawn, an ornate seat, and a variety of trees including gingko. Tube: Sloane Square (District, Circle). Bus: 11, 19, 22, 211, 319. One of the characteristic handsome elongated squares that open up off King's Road and provide vistas of domestic calm from that busy street. Markham Street (laid out c.1830) and Markham Square were built on the former farmland of Box Farm and were named for Pulham Markham Evans, the last owner of the farm; the Markham family reputedly had common rights since 'the 29th year of Elizabeth'. In 1858/9 a Congregational Church, designed by John Tarring, was built in the square. Bomb damage in WWII damaged some properties in the square. To the east and west of the square the original three-storey terraces remain, with stuccoed ground floors, balconies and railings, but to the north the Congregational Church has been replaced by 1950s development. The central enclosure was owned by the freeholders of houses of Markham Square who annually elected a Square Gardens Committee to maintain it, as well as to enforce byelaws that were allowed in 1923 by Mr Justice Eve under the Authority of the Town Gardens Protection Act of 1863. In 1928 it was described as a 'rectangular enclosure with thick shrubbery around the border. Laid out as an ornamental garden with lawns, trees etc.' The garden was laid out as a cherry orchard in 1935 in celebration of the Silver Jubilee of King George V, and after WWII it was re-landscaped in the style of a country garden by the head gardener of the Royal Hospital. The garden today is surrounded by modern railings with hedging along King's Road frontage. Within the garden are shrub and flower beds with a central bed, lawn, an ornate seat, and a variety of trees including a gingko.